Cold-brew coffee makes a full-flavored brew than regular iced coffee. Cold-brew coffee has a richer, fuller flavor than regular iced coffee, which is brewed hot and then poured over ice cubes. 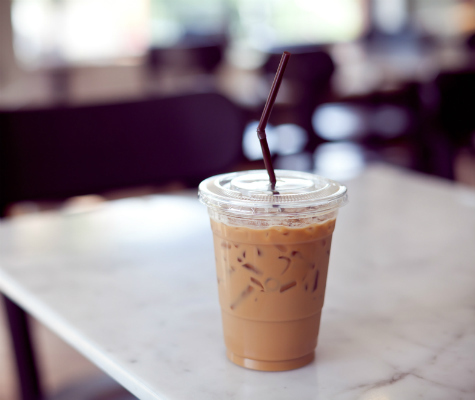 Traditional iced coffee tends to taste a little bit like stale coffee, and is often very acidic. Cold-brew coffee may take a little extra time, but the result is an iced coffee that is more powerfully flavored, and perhaps a bit tart. The resulting product of the cold brew coffee process is a kind of coffee concentrate, so don’t go overboard — make sure to dilute your glass of iced coffee with cold, fresh water or you’ll be drinking far too much caffeine. Use simple syrup instead of sugar to sweeten your drink, as sugar won’t dissolve in cold drinks, but simple syrup will work just fine. If you want ice cubes to keep your drink colder longer —but don’t want your drink to get watered down by melting ice cubes — try making your own coffee ice cubes. To make ideal coffee ice cubes made just to your taste, prepare your cold-brew coffee exactly the way you like it (the perfect proportion of coffee, cream, and sugar to taste), then pour into an ice cube tray and allow to set in the refrigerator for a few hours or overnight. These coffee cubes will keep your iced coffee cold even on the hottest days, and when they melt, they won’t dilute the flavor of your coffee one bit. Try The Best Iced Coffee Recipe.